As for me, though, I want to suggest the whole game may be changed. Depending on two countervailing forces. Far be it from me to pretend to be the judge of the very interesting debate on CliScep recently between two titans of our own blogspace, Paul ‘crazy optimist’ Matthews and Geoff ‘slough of despond’ Chambers. Except to say that Paul was right and Geoff was wrong. I was going to do a post a couple of weeks ago called The Hooray Henrys of Hurricane Harvey in which the aforementioned gentle mockery would again have been deployed against the silly billys of kneejerk alarmism. But the glass half full was strongly present for me throughout that time (and indeed in the last minute, unpredicted changes-for-the-better to Irma). Not least because the New York Times now has a brilliant, articulate climate sceptic to explain the true situation. Bret Stephens’ Hurricanes, Climate and the Capitalist Offset on 31st August is good by any measure but what makes it so significant is where it was posted and who therefore will have read it. Of course there would have been much dreck on the subject in nearby pages. But the sheer good sense and mastery of key stats from Stephens makes the NYT glass well over half full from where I’m reading. My thoughts exactly. Since my own blog post on the last day of 2011, four numbers that tell a story, published partly with software practitioners in mind, I’ve seen deaths from extreme weather events as one of the strongest lines of evidence for non-alarmism. Although this time there were obligatory run-outs from the likes of a tired-and-not-very-scary-sounding Mann in the Guardian my overall sense was that excellent efforts from sceptics (eg Nelson & Darwall, Ridley, Spencer, O’Neill), in long form and tweet form, were shaping the narrative more than before. No, not the BBC. Not yet. The triumph of the environmentalists has had an enormous and costly impact on our daily lives. Successive governments have brought in green taxes, hiked fuel duties and pushed up energy bills. The real price is paid not by the eco justice warriors wallowing in their phoney moral superiority, but by people like those in my Blackley and Broughton constituency, who struggle to meet their household running costs. An extra £100 a year on electricity and gas might not be much to a BBC presenter, but it is a heck of a sum for someone who lives in the Harpurhey ward of Blackley, which was named in 2013 as the most deprived neighbourhood in England. This week’s scientific report should mark a return to environmental sanity in place of the current dangerous green fundamentalism. But given my own experience, I wouldn’t bet on it. What is it about this pessimism that made me more hopeful on completing it than at any time during the very exciting last two days? But then paradox has been a crucial part of the AGW scare from the beginning. I see that Allen isn’t pointing out that not all of the rise from pre industrial levels is man made and only most of that from the 1950s (if we still believe we can trust any of the science). Even a tranche of the CO2 up to the 50s was as a result of the warming, not the other way round. He also didn’t point out that far from using a single value for the effect of CO2, they have a massive range, which may still be too hot as it starts at 1.5°C and goes up to 4.5°C. The 1.2 °C for a doubling of CO2 in the lab is never used. I do see this as a turning point. I wrote on BH that the potential for a new La Nina must be giving them uneasy feelings. If the Pause resumes, regardless of hand waving at sea level rise, the game is pretty much up. Given the nature of CO2, we should be seeing the fastest effects right now. Ice hasn’t gone into a death spiral. It hasn’t triggered the predicted tipping points and it looks like wind direction and jet stream play a massive part. The US drought didn’t last forever and every time the MET Office talks about a new normal (eg wet winters) it does the opposite. But most important of all, the politicians are bored of AGW. They’ve wised up to the money pit that are renewables. There will be no ticker tape parades for green leaders, even if CAGW was real and even if we still had ticker tape. They’re more likely to be TPed. Soon CO2 will be a toxic issue. Will the draw back be slow and subtle or will there be a sudden rush for the exits? Tiny: So CO2 will go from being pollution to being toxic? 🙂 But I know what what you mean and I strongly hope so. There seems to be a bit of dissent and panic and damage limitation going on. Ed Hawkins has one of his regular the-models-are-doing-fine-actually blog posts. Oxford Martin have issued a “clarification”, criticising certain unspecified media reports (perhaps they mean Dana in the Guardian). then where did all the claims that the models are overestimating come from? I long since decided that Gaia was a tiger mom. She wants her favourite babies to succeed and get a place of their own. They’re not going to do that if they’re scared of their own shadow. She’s not bothered by CO2. Paul, it’s part of their 1000ft barn door that they’ve clipped with their massive bulldoser defence. It still counts as hitting their target. Before long they will adopt the ‘we didn’t hit the barn door but we’re in the right post code’ argument. If my glass was only half full, no wonder I was despondent. In fact I’m far from the Slough of Despond, but neither am I on the Chiswick Flyover of Jubilation. I’m still taking a breather in the Layby of Scepticism. If the models predicting accelerating warming have failed, you’rd expect at least a graph plotting model output against reality. But there’s no graph plotting reality at all, but simply wildly precise estimates of future CO2 output consistent with wildly overprecise estimates of future temperature rise under various wildly over-precise conditions. Geoff: I embellished just a little. Thanks for the reference to the paper. As you say the absence of anything “plotting reality” is very strange, as is the spin being put on the findings since. What interested me in the first place were these strong reactions from sceptics. There’s much else. They had to do something because the doomsday clock went past midnight, and nothing happened. If the article doesn’t say the models are wrong, what does it say? The abstract tells us that keeping average global temperatures rise to the arbitrary politically established limit of 1.5°C above the temperature at the arbitrary chosen date of 1880 can be done, according to a new interpretation of the models, while emitting a much larger amount of CO2 than previously thought. Scientifically, it’s about as interesting as a letter from the gas board announcing that they’ve overestimated your consumption and offering a rebate. 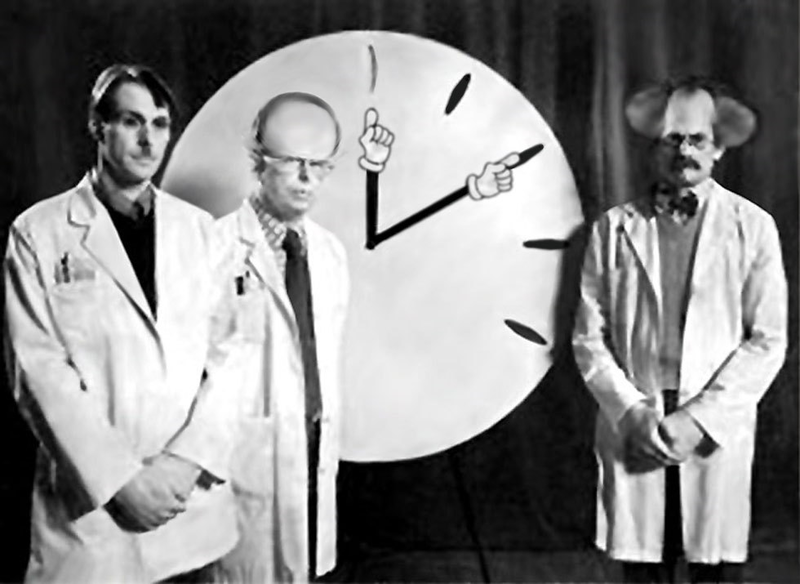 Ron, since I first heard about the doomsday clock I’ve found it very annoying. It’s smug nagging by people who are pretending to have turned crystal ball reading into a science. Worse than the climate scientists. Geoff, climate scientists have always pretended that they learn as much getting things wrong as getting them right. Rubbish. There is only one right answer but countless wrong ones. They given themselves a wide range so that while the values bump along the bottom, they can still pretend that they’re technically not wrong. For a few years after they drop out of the range they can and will pretend that the it’s just a blip. Myles Allen is also part of the group convinced that the public are suffering from denial because the consequences of CO2 are so immense and inevitable, so he probably thinks that giving us longer to midnight, might spur us into action. The Oxford Martin “clarification” (link in previous comment) is very muddled. It’s written by Myles Allen and says that there have been some false assertions in the media saying that things aren’t warming as fast as predicted. But who is making these assertions? Well, it’s Myles Allen, in the Independent (link in Richard’s post). Jo Nova nails it: “Latest, belated admission the models were “too hot” is all PR and politics, nothing to do with science”. Thank you for the link. Nova quotes Delingpole’s article in Breitbart from two days ago at length, entitled Climate Alarmists Finally Admit ‘We Were Wrong About Global Warming’. In a fuller head post I would have linked to that myself. You can see how James ends there with the motif he uses to great effect at the start of his Sun polemic the following day: “Sorry is the hardest word.” What the Breitbart piece lacked (and I felt this strongly on first reading it) was just how sorry people need to be (and not just scientists) about $1.5 trillion being diverted every year from productive uses to highly corrupting ‘climate mitigation’ boondoggles, for which the poor disproportionately pick up the tab. That’s front and centre in the Sun. But the Breitbart article does include important supporting detail, not least the GWPF briefing on climate sensitivity over three years ago by Nic Lewis and Marcel Crok, with foreword by Judith Curry. For completeness that’s A SENSITIVE MATTER – HOW THE IPCC BURIED EVIDENCE SHOWING GOOD NEWS ABOUT GLOBAL WARMING. Some climate sceptics may feel I conceded too much in this conversation but there it is. I’m interested as ever not just in the ‘objective truth’ but how we persuade society away from such self-harm. Jo Nova’s article linked by Phillip Bratby above gets to the heart of it, expressing what I struggled to say in a comment above. It’s not science, it’s politics – no – it’s an apology for politics. A politician wouldn’t think he could get away with such wild approximations as going from “1880” to “mid-nineteenth century” to “pre industrial era.” Only a team of half a dozen scientists could be so sloppy. The Paris Agreement has opened debate on whether limiting warming to 1.5 °C is compatible with current emission pledges and warming of about 0.9 °C from the mid-nineteenth century to the present decade. We show that limiting cumulative post-2015 CO2 emissions to about 200 GtC would limit post-2015 warming to less than 0.6 °C in 66% of Earth system model members of the CMIP5 ensemble with no mitigation of other climate drivers, increasing to 240 GtC with ambitious non-CO2 mitigation. Translation: We’re 66% sure that we’ve got four times as much carbon we can safely emit as we thought we had in order to keep within a limit of 1.5°C based on an estimated rise so far of 0.9°C (give or take a half a degree) from some time variously defined as 1880, 1850 or thereabouts, or before the industrial era whatever, and based on a climate sensitivity known to within 3°C or thereabouts. These people are probably too brainy to realise it, but they’re liars and charlatans. If they tried this on in a commercial context they’d be prosecuted. Phillip, exactly what I said to Richard Betts two days ago; there’s no new science, the study is pure political posturing. There's no 'new facts' or new science here that I can see. Low sensitivity estimates were already 'a thing' in 2015. It's just politicking. The impression is that these people are just pulling figures from a hat to match the prevailing mood. Nothing much has changed since 2015. Jaime tweeted a link to an article in the Evening Standard, saying that the paper ‘has been dangerously misinterpreted’. The expert saying this is our old friend Mark Maslin. He must be worried that his attempts to team up with Al Gore and abolish democracy may be under threat. Of course there’s also another whine about Donald Trump. More evidence that the whole thing is political. We can emit more than 3 times carbon than previously assumed and have four times as long to reduce emissions. But that change in the ‘settled science’ is not nothing, as both Delingpole and Stringer, and the editors of the Sun and Mail, realised. There’s no new science here but there is an acknowledgement that sceptics’ criticism of the previous version of the non-science was right. Or, at the very least, in the right direction. Myles Allen being on the naughty step for saying the glaringly obvious, that the models on which the world’s governments have been relying for guidance have been running hot, is hilarious. This is botched spin, under pressure from Mother Nature herself, and that’s what makes it both funny and an opportunity. Carbon Brief have one of their so-called factchecks. Clive and I have commented. The 'Pause' was busted in 2015/16 by El Nino. Why release this now? Because a strong La Nina may re-establish the Pause perhaps? Why on earth would the Met Office be wittering on about the end of the pause now? I think what’s got them worried is the increasingly real prospect of global cooling, not just short term, but decadal. Some models are predicting a strong La Nina this winter, which would be a very odd occurrence coming two years after El Nino peaked in Dec 2015. I may be wrong, but I don’t think anything similar has happened since recording began in 1950. If it does happen, there will be more awkward questions about the role natural variability plays in climate change vs. CO2 emissions. Of course, climate models being climate models, they may be wrong – some were predicting a return to El Nino conditions this year! Which is a useful point. If it’s now ended it once existed! I’ve commented at Carbon Brief too. Don’t think they will be amused. Richard, the Pause both exists and doesn’t exist, depending on the observer. It’s a true quantum mechanical phenomenon which lies at the heart of modern climate science. of course, be pointing up or down. Each clause means naught, one and all. .. Mark Maslin, professor of climatology at UCL, told the Standard this projection is based on the assumption that every country “does absolutely everything in its power” to combat climate change. And that hasn’t been the case,” he said… Professor Maslin added that it is “unlikely” the paper’s prediction will be correct “because every country has its own agenda and obstacles that need to be considered”. Expanding on his view, professor Maslin added: “The paper isn’t necessarily wrong, it just should not be misunderstood. “The reason they [the researchers] have done this is to provide optimism, and to show that if humanity as a whole wants it to [achieve this goal], then it can be achieved.” The data suggests that countries have more time to get a grip on their carbon output, and also attributes an unexpected “revolution” in affordable renewable energy to its “more positive” outlook. Does it not worry you that your title is a lie and is contradicted by the IPCC and the authors of the paper? It turns out the lead author, Richard Millar, and Myles Allen have an article in The Guardian today seeking to shoot down Delingpole and Stringer: When media sceptics misrepresent our climate research we must speak out. (As for climate activists misrepresenting the IPCC on extreme events, as has happened a lot recently, they obviously will be doing the same, with the same ferocity. The headline writer just failed to mention that possibility.) Strangely Millar and Allen don’t mention the Nic Lewis sensitivity paper for the GWPF, which Dellers did point to on Breitbart. Might not fit the “urging their readers to question whether the Earth goes round the Sun” stereotype. Best leave it out. The damage limitation mushrooms. Thanks Geoff for Maslin’s strange angles. the very yin and yang of alarmism have had to be broken. Because Mother Nature. It’s better than we thought and that implies (in the simplicity of the wisdom of the voter in the street, as brilliantly understood and exploited by Vote Leave last year) that the science isn’t settled at all. Maybe it really wasn’t a mea culpa on behalf the models this time, despite pretty words to that effect. But, whatever the reason, it’s better than we thought. Ain’t that grand. They know the models are wrong but they also think that we’re under-reacting and losing all enthusiasm. They think that the under performance is due to despair – might as well enjoy the good times while we can. So they’ve admitted that we’ve got longer so that not only will we keep current actions going but we’ll redouble our efforts and meet the targets we were going to miss. Like every con man, when you don’t meet the last chance deadline they amazingly find a bit longer. But they can’t get round the failing models. Even if they try to pretend that the very bottom of the model range counts as ‘right’. The range should be shifting downwards or narrowed on the lower values of sensitivity but they don’t want to admit that because they start to lose the more alarming predictions. That has knock on effects with sea level rise, tipping points, wildlife adaptation, natural CO2 absorbtion and a lot of other stuff. cumulative emissions do not reach 545 GtC until after 2020, by which time the CMIP5 ensemble-mean human-induced warming is over 0.3◦C warmer than the central estimate for human-induced warming to 2015. In estimating the outstanding carbon budget for 1.5◦C, this is an important discrepancy. Taking an average across ESMs suggests that our cumulative emissions to date would correspond to about 0.3C more than best estimates of human-caused warming so far. the analysis focuses in part on the fact that global climate models used in the 2013 report from the Intergovernmental Panel on Climate Change (IPCC) tend to overestimate the extent of warming that has already occurred. In the radio prog, Myles Allen denies that there’s a consensus too. After my Dad had a stroke he did this. One week he had one position and I had another but by the next week he’d reversed who said what and swore I’d argued his original position. It enabled him to maintain the idea he knew what he was talking about. How long before ‘deniers’ are the ones who said the planet was going to fry and the good scientists were the ones calling for scepticism? Fabulous summary of the double-facing double-think (so far) Paul, thank you. As well as the paleo-corruption shenanigans, the Climategate emails showed climate scientists, notably “travesty” Trenberth, being real about the problems for their theories behind the scenes. Yet determined never to be this honest publicly lest they give “fodder to sceptics”. The various pseudo-inquiries may then have let them off the hook but Mother Nature hasn’t. Except, as sceptics have been saying, the facts are in fact largely unchanged. It’s just that covering up the cracks is becoming almost impossible. Refuse to face up to the profound dishonesty revealed in November 2009 and it will come back to bite you. But instead of saying “fair cop, Lawson and the others got some important things right” the demonisation of opponents has increased again. So we have the racist and sexist nutters released, as shown by Geoff’s latest. It’s not science, it’s ugly and people like Myles Allen are going to have to face up to every last bit of it. Tiny: which radio programme was that? He was trying to tell Julia Hartley Brewer that scientists don’t work by consensus. I think he also said that they protest when the science is exaggerated. Of course his idea of exaggerating and ours’ would differ. For now. Thanks, so the radio programme I myself originally linked to! I think you may go too far in your previous post. The limits to demonisation. Interesting. What an improvement. Cliscep removes a slimy political animal called Al from its masthead and replaces it with a gorgeous gastropod! I wasn’t sure if the gorgeous gastropod was meant to depict me. * or was it. “When events change, I change my mind. What do you do?” , or. “When my information changes, I alter my conclusions. What do you do, sir?” or even “When someone persuades me that I am wrong, I change my mind. What do you do?” All so confusing. I’ve seen at least 4 charts claiming to show “models do not overestimate warming.” Ed Hawkins has one for example. But I pulled up Steve McIntyre’s version of an earlier Richard Betts chart. I just wish people could be more honest about how they are presenting this data. In all honesty I would trust McIntyre more than the usual subjects. I can’t think of any other field where a co-author of a new paper could boast “when the facts change, I change my mind” after he and his colleagues failed to be honest about such basics for years, then they smear those drawing attention to their apparent new-found candour in the popular press as “urging their readers to question whether the Earth goes round the Sun”. Yes, climate science is very, very special science. But then there is always paradox – or a heck of a fight – in this game, as I said. I have taken a detailed look at the Nature Geoscience paper, which has Myles Allen as the star name. When looking at mitigation policy to constrain warming to 1.5°C there are opposite problems. If ECS is too high (e.g. ECS = 3°C) there is already sufficient warming in the pipeline (or hidden in the oceans) to make it inevitable. If it is too low, then it falls below the IPCC’s range of 1.5°C to 4.5°C for a doubling of CO2. The paper thus pushes the variables to the very boundaries of the IPCC’s range. – Assumed that all the warming since 1870 is caused by anthropogenic GHG emissions when there is not even a valid statistical test that confirms even half the warming was from this source. – Largely ignored any hidden heat or other long-term response to rises in GHGs. – Ignored the divergence between model predictions and actual temperature anomalies since around the turn of the century. This has two consequences. First, the evidence appears to strongly contradict the belief that humans are a major source of global warming and by implication dangerous climate change. Second, if it does not contradict the theory, suggests the amount of warming in the pipeline consequential on human GHG emissions has massively increased. Thus the 1.5°C warming could be breached anyway. – Made ECS as low as possible in the long-standing 1.5°C to 4.5°C range. Even assuming ECS is at the mid-point of the range for policy (as the IPCC has done in all its reports) means that warming will breach the 1.5°C level without any further emissions. I’ll summarise thus: the paper is nonsense-on-stilts that finds ways of subtly adjusting previous nonsense-on-stilts to imply that we should not lose hope (because it’s too late anyway) but press on with futile and highly damaging mitigation efforts. But debating the current level of human-induced warming and how it relates to the 1.5C goal feels a bit like discussing how best to steer a spacecraft into orbit around Saturn while Delingpole and Stringer are urging their readers to question whether the Earth goes round the Sun. Delingpole and Stringer were questioning, above all, whether the £1 trillion per year is worth it. In making no effort in the Guardian to admit some of these concerns may be merited the authors will be taken, under the guise of phony authority in totally different areas of study, as saying that questioning any part of so-called mitigation is on the same intellectual level as questioning whether the Earth goes round the Sun. means at best their quibbling is about which sums they’d got wrong, when any honest follower of the sensitivity debate knows the very wide range put out by the IPCC for ECS, which incredibly has not narrowed since the first assessment report in 1990, despite upteeen billions going into ‘climate research’, is by now massive misdirection. There are gigantic humanitarian reasons to be concerned about the $1.5 trillion. Any human being with empathy should be able to express this. To call people doing so flat-earthers is its own self-destructive moral meltdown. Yesterday’s Sunday Times, Climate change predictions — what went wrong? See behind the paywall of that article at Paul Homewood’s blog. Rod Liddle: Climate believers won’t go cool on global warming, they’ve an industry to support (more visible here). David Whitehouse, Climate scientists shoot the messenger, a good summary of the scicomm car-crash. Compare this is Sir Nicholas (now Lord) Stern’s 2006 Report headline statement of the costs of policy against the costs of unmitigated climate change. Clearly cost control is not a great thing amongst the climateers. They have doubled in real terms in just a decade. Also, they have failed to justify (from an auditable perspective) the vast costs of unmitigated climate change. One element that constitutes the costs of global warming is the rate of increase in temperatures over time. Lower climate sensitivity rates mean slower warming rates and much much lower costs. No wonder Lord Stern is writing to The Times to deflect attention. Manic, are you sure you have correctly understood what is being discussed? The 1.5 trillion represents economic activity. You may or may not like what it involves, but that is true of any component of the world economy. Stern, on the other hand, is talking about a reduction in economic activity; not just the opportunity cost of climate related investment etc, but an outright loss. Maybe I’ve got that wrong – you’re the beancounter, explain why if so. Your comment is incomprehensible to me, especially the first two sentences. But then it is a few decades since I did an economics degree. Rather than getting me to waste time on trying to guess why you are wrong in thinking I am wrong, maybe you should clarify why you think I am wrong. I’ll make it simple for you. If you go to the cinema or concert you cannot at the same time go to a football match. The cinema visit cost you the opportunity to go to the match. Climate related spending is like that. If, instead of either you stay in, that is an economic loss. So you are comparing a 5% loss with a 1.5 trillion opportunity cost. Clearly that is inappropriate at best. For an accountant with an economics background, that should be obvious and not require explanation. Wow Len. Not content to chastise me in the past about my geological acumen, now you add insult by trashing Manic’s economics understanding. Are you sure your name isn’t Master Jack? Now you have clarified what you mean I can reply. – Higher costs of flights means taking less holidays abroad or traveling shorter distances etc. – More time spent traveling to work as personal transport becomes more expensive. – Higher costs of cars, vacuum cleaners, washing machines etc that also do not perform as well. E.g. eco-washing machines take longer to wash and do not wash clothes as well. – Businesses having to spend money and time (form-filling, investments to meet rising legislative demands) being green, rather than concentrating on core competencies. – High energy-consuming manufacturing and other industries moving to non-policy countries. Stern did not look at any opportunity costs. The biggest of which was the sacrifice of economic growth. For emerging nations, to adopt the policies escalate energy costs year-on-year is politically dynamite where there is an expectation of rapid emergence from poverty. That is why emissions will not be drastically reduced, or even the growth seriously curtailed in China, India, other SE Asian countries, most African countries the Middle East etc. 1. He imposed a near-zero discount rate, based on his personal preferences. Actual decision-makers choose much higher discount rates. People tend to give much higher preferences to the course of their own lifetimes and those of their children into adulthood. In Britain it was only the landed gentry (mostly with hereditary titles that planned generations ahead. Even then it was to maintain income and property, not to offset some prophesied apocalypse. 2. Climate mitigation will not be adopted by all countries. Even if the high costs of unmitigated climate change were credible, countries representing a small minority of the world’s population adopting drastic emissions reductions whilst the rest of world does little or nothing, will mean the policy countries will be net worse off if both policy costs and the residual unmitigated climate costs are compared with the costs of that country doing nothing. 3. But climate costs were not calculated properly. Any rational policy-maker would look into the likelihood of things happening, not take as gospel truth the most alarmist nonsense anything published in the academic literature as the Stern Review did. Since then the most cataclysmic prophesies have been quietly shelved, so expected unmitigated climate costs are much lower. In other words, it is still unclear. But we either lose 5%, or spend 2% and lose some other amount of GDP. The conundrum seems tricky to me. What does the clown-dancer make of it? Alan, I don’t remember why I criticized you, but if it was for not recognising a basic concept of what you claim competence, as with Manic not understanding opportunity cost, I make no apology. Manic, if Stern’s numbers were for an absolute loss for the economy, as the barrel man says, then they are not comparable with opportunity costs. The latter are ubiquitous. There’s an infinite number of them and it is often difficult to know whether each results in a smaller or larger economy or more or less wellbeing overall or over what timescale. I’m sure that won’t stop people like you claiming certainty with regard to climate, fossil fuels and renewables. Len. A “basic concept”, as defined by you? At the time, I asked for your competence to make such a judgement, but guess what, you wrote that that wasn’t necessary. Yet you keep claiming competency in a whole slew of subjects. You’re a charlatan. ATTP’s reaction to Whitehouse is already up. When you are in the “communication” business, rapid response is viewed as critical. Can’t allow the opposition view to go unanswered and possibly gain traction. Alan, opportunity cost is such a basic concept that any interested layperson knows what it is. I don’t know what basic concept I was discussing with you. If one looks to the IPCC instead of the stern Mr. Stern, we see that losses do not start to be meaningful until the 2040s. Which brings up another point. Are we building up a ‘debt’ of sea level rise? It continues at 3.2mm/year, far lower than Hansen and associates have predicted. We’re now 17% through the century–we’ve got some real catching up to do! Ah, the road not taken–opportunity knocks before it costs. Len. I do recognise that to give you any opportunity will cost me. Even small children can be shown to understand the concept of opportunity cost when it involves sweets. Thus to accuse a graduate in economics of not clearly understanding the concept was truly insulting. But then who the devil are you, are you even a single person? Thus to accuse a graduate in economics of not clearly understanding the concept was truly insulting. I thought the whole premise of this site was to basically accuse relevant experts of not understanding something that should be well within their range of expertise. I don’t know if Len is doing what you accuse him of doing, but why would you object if he is? ATTL. “I thought the whole premise of this site was to basically accuse relevant experts of not understanding something that should be well within their range of expertise”. But climate science is a misnomer. It is a SUBJECT toward which different sciences are directed, and here it is possible to criticize that application. But more importantly Len insultingly questions someone’s qualifications and their understanding of BASIC concepts. All without disclosing his own qualifications to make such judgements. It is upon this that I am calling him out and have done in the past. Ross McKitrick (originally an economist, but one who has specialised in environmental matters, for those interested in expertise questions) has explained the kerfuffle well in Are Climate Models Overstating Warming? at Judith Curry’s, defending the paper’s statements/graphs on models v temperatures and asking good questions about Hausfather, Cowtan et al. I had thought I wasn’t going to comment further on Cliscep for a bit but that and another blog post by John Gibbons drew me back. You are just trolling. Given that you have diverted from the topic and make fresh, unsubstantiated, accusations I will assume that you concede my earlier points. Climate science is not a subject. It is an umbrella discipline covering a multitude of subjects. Which is what allows ATTP as an astronomer to pronounce authoritatively on biology. Mistakenly, but authoritatively. Just following in Hansen’s footsteps. No, that’s actually not fair at present. Over at his blog, ATTP has started hedging his posts. We should give him credit for softer phraseology. This story continues to run. JD says that for pointing out what the article says and what the authors said about it, you get labelled a flat-earther. Alan, he doesn’t seem to understand that absolute losses are not the same as opportunity costs. But then none of you want to understand that, so he should feel at home here. Len when you confirm your qualifications in economics (which could be personal study), I’ll pay you more attention. Until then it’s white noise. $1.5 trillion a year of policy costs. 1% of global GDP of policy costs from the Stern Review. 5% to 20% a year of CAGW costs in 2100 from the Stern Review. The only opportunity costs considered by Stern, in my opinion, is the discount rate. That is the opportunity of costs now against the future. This was set arbitrarily low and does not reflect the time preference of most people around the world. In the first sentence the “we” refers to the authors. In the second the “we” refers to 7500 million people in about 195 countries. So wrapped up in their climate models these activist climateers cannot recognize that the world does not follow them. Although they have manipulated the figures to make it seem that theoretically, their desired emissions pathway is possible, politically it ain’t going to happen. The gap between desired policy and political reality is huge as shown in this graphic. What irritates me is that as a Britain, living under the crazy Climate Change Act 2008, I and future generations of Britains will be net losers whether CAGW is true or not. 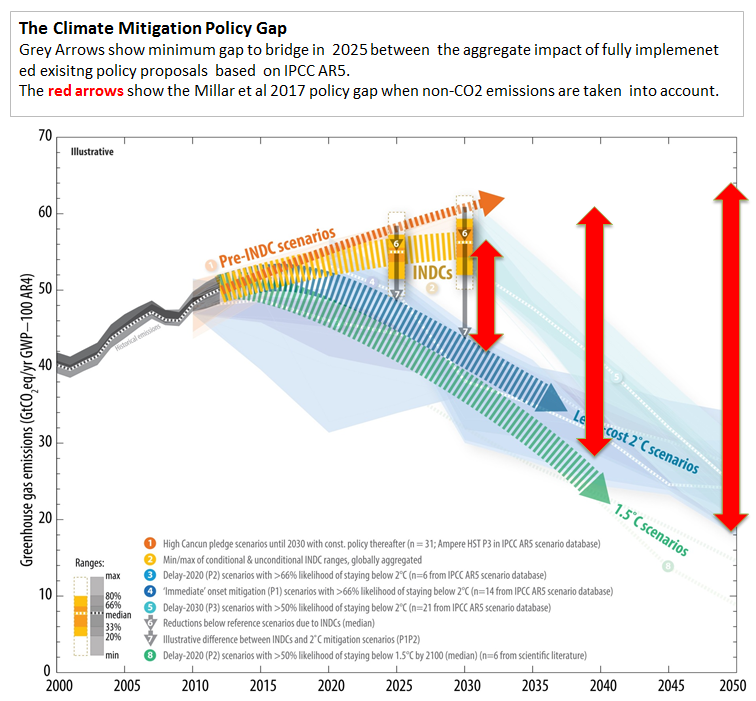 Any mitigation achieved in the UK will not significantly impact on global emissions due to the policy gap, and that gap has no prospect of being closed. More details here. All I understand is I don’t want the ‘opportunuty’ to be forced to buy something I don’t want. There is now yet another attempt by the authors of this car-crash to try to explain what they meant, at Carbon Brief. Richard. I have become slightly unnerved by the gaze of the molluscan stilted orbits that now inhabit this site’s masthead and do so with your name’s affiliation. Does this steadfast gastropodan observation suggest the escargot’s anticipation of my garden flora ( or even of my corpus, prematurely buried)? Even worse the eyestalks could belong to a SLUG!! Trump and Gore were bad precedents when you opened this site, but this is now a creeping horror. I long for its replacement. Make it some beautiful visage of wind turbines, I beg of you.